Pictured seated, from left, are Savanna Goss, Aliesa McCrum, Lyness Mudila, and Tori Calizo. Pictured standing, from left, are Adrian Bowdler, Ryan Gormaly, Abigail Burns, Carly O’Hara, Angella Stichter, Mason Roesner, and Kathryn Monsma. 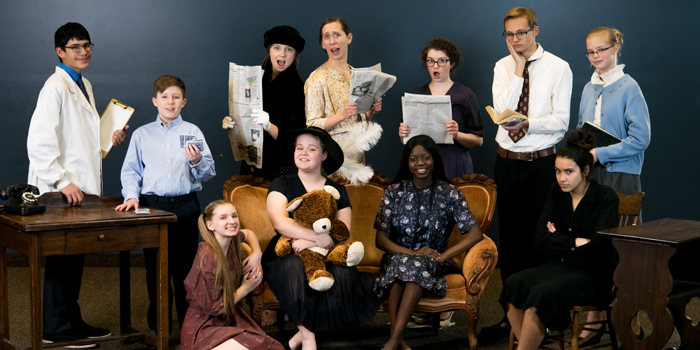 WINONA LAKE — Lakeland Christian Academy will present “The Curious Savage” by John Patrick at 7 p.m. Friday, April 12, and at 2 and 7 p.m. Saturday, April 13. Performances will take place at Lakeland Christian Academy. Tickets are $6 at the door and doors will open at 6:30 p.m.
“The Curious Savage” is a warm comedy that compares the kindness and loyalty of psychiatric patients with the greed and hostility of so-called “normal people.” This is an entertaining and fanciful comedy where kindness and affection triumph over greed and dishonesty.